The classic Lancaster traditional bath shower mixer with shower kit, part of our range of quality chrome plated deck mounted traditional bathroom taps, features a elegant spout design and expertly crafted white ceramic lever handles, its classic design will bring a touch of sophistication to your Bathroom. Manufactured from solid brass with a stunning chrome finish. Includes standard cradle, ceramic diverter, flexible hose and ceramic telephone handset. 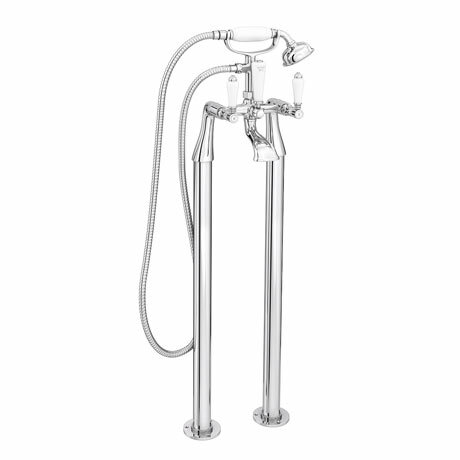 The free standing heavy duty bath standpipes have a fantastic chrome finish. These standpipes allow you to fit a Bath Shower Mixer or Bath Filler over the edge of a Freestanding Bath which has no tap holes. The taps look very good but as of yet not fitted.